Former Illini gymnast performs as Kevin Bacon stunt double on “The Tonight Show with Jimmy Fallon"
Watch the epic talk show entrance featuring U of I alumnus Andres Saavedra to celebrate the 30th anniversary of Footloose. A former Illini gymnast, Andres Saavedra didn't flinch when NBC asked him if he could perform on the high bar for a skit that would air during last Friday's "The Tonight Show starring Jimmy Fallon." Even if it meant doing it wearing jeans. And shoes. And a wig that made him look like Kevin Bacon. "I have dark, black hair," Saavedra said. "So I needed a wig. I don't look anything like Kevin Bacon." In the wildly popular finished product, he sure did. NBC on Monday said the video highlights of Bacon's ode to the 30th anniversary of "Footloose" on Jimmy Fallon's show — in which Saavedra served as the 55-year-old actor's stunt double — had been watched 7.3 million times. 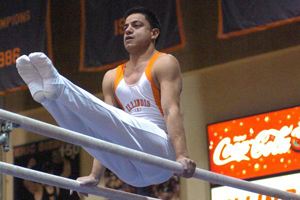 "It's great that it shed light on Andres and on Illinois gymnastics," UI men's gymnastics coach Justin Spring said. Paul Ruggeri, an NCAA champ while at Illinois, originally got the call to do Bacon's gymnastics routine. But he handed off former teammate Saavedra, who met NBC's criteria in that he was close by (New Jersey) and fit (he's training for the Pan Am Games).